We know that standards cannot impact student learning if they’re just sitting on the shelf. We need teachers who can teach them. Standards accomplish nothing alone. But many teachers have told us they still feel unprepared when it comes to the Common Core. Are you one of them? 1. The SIT & LISTEN model is not an effective way to train. Thanks to studies by The Consortium for Policy Research in Education, we have known this for a long time. Although districts continue to favor this passive, large-group model, it’s clear that it doesn’t improve student learning. 2. The COACHING model works best. Coaching taps into the collective wisdom of teachers and encourages sharing of successful practices within grade-level teams. 3. The biggest challenge in teaching the K-5 Common Core ELA Standards is WRITING. 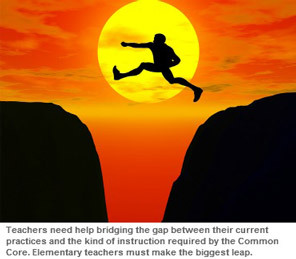 Even more than making the leap to reading complex texts, teachers are hard-pressed to meet the new writing standards without help. Teachers: Use the reflection guide as a personal professional development evaluation. It will help you determine your strengths and weaknesses in your writing instruction. Administrators: Use the reflection guide when planning a professional development day. Follow the directions below. 1. Print “Questions Teachers Have When Teaching Writing”, and pass the reflection guide out to your teachers. 2. Ask your teachers to follow the directions in the reflection guide. They will fill out their glows (strengths) and grows (weaknesses) for writing. 3. Design your professional development day into sessions where each teacher will have 10 or 15 minutes to share a teaching idea or tool they have used successfully. 4. Teachers can consider their “grows” and choose to sit in on sessions that will be most helpful to them. What was your most memorable professional development experience? Tell us in the comments section below.